Whether used for a residential septic system or a rural well, American Tank Company's underground storage tanks are designed to endure their harsh environments. 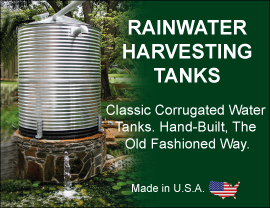 Constructed of sturdy ribbed polyethylene or fiberglass reinforced plastic, these underground tank units are made to resist the permeation of chemicals and gases naturally present in soil and sewage. As with all American Tank Company products, these cisterns and underground tanks are developed under strict quality guidelines that ensure an environmentally friendly resultant. A variety of accessories, including manhole covers, extensions and lid /riser combinations, make it easy to self install your underground storage tank to meet code. Offering the strength and durability you've come to expect from all our products, these underground storage tanks provide a permanent, cost-effective solution to an array of underground water storage needs. Call American Tank Company today and see what we can do for you. Please Note: All non-sphere cistern and septic tanks should remain 25% full at all times. Call toll free today: 1-800-655-9100 to speak to one of our friendly and knowledgeable Underground Tank Specialists.